This morning I woke up first. I gave her a kiss on her head and let her sleep in a bit. She must recharge from her work as it is quite busy recently. I didn’t have a concrete plan on what to do. Studies are in the planning, but, for me it is weekend too. From afar I was looking at myself, I was seeing myself making coffee. I stood there at the sink pouring water in the coffee maker, I added coffee, and put it on the stove. With a click the fire jumped on and now it was waiting till the coffee was ready. I saw myself going outside putting the coffee on the table. It is a simple garden table with one leg on the ground and the back is attached to the wall. The table is standing on a little terrace with a roof preventing the rain to get in the house during monsoons. In front is the garden that we share with her parents. In the garden are coconut and other fruit trees. There is a swing behind one of the trees looking from our side. 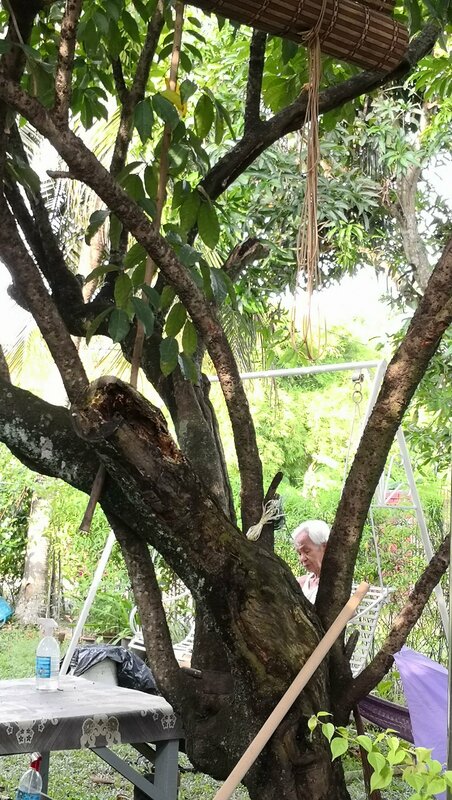 Ayah, my father in law, was sitting there reading and humming. He too was completely in his own world and didn’t notice me at all. The skies were blue with some occasional scattered clouds passing by. Some birds were singing, some other birds were taking care of their babies. They flew from here to there, catching worms and bugs they brought as food. These kinds of moments are beautiful, magical and worth to live. I saw myself sitting letting it happen. I was right there, in that moment observing without thinking. I was in a near meditation so peaceful as that moment was. I was listening to the birds, to his humming, and to the bugs and the bees making their own particular sounds. There was that fresh smell of coffee, its pure taste, deep black, bitter and full of aroma. She was sleeping, being in dreams, while I took this moment, this Sunday morning enjoying my moment in the garden. With the same snap I got out of the world I got back into it again. I enjoyed my coffee, my moment, and with full senses I went back inside again. I opened the bedroom door and saw her with her eyes open. A kiss, a stroke on her cheek. “Good morning my dear”, I said with a whispering voice. That marked the start of the day. How about you? How did you have your morning?